Honolulu Museum of Art » Moananuiākea: One Ocean. One People. One Canoe. Directed by Na'alehu Anthony. 2018. Hawai'i. 148 min. 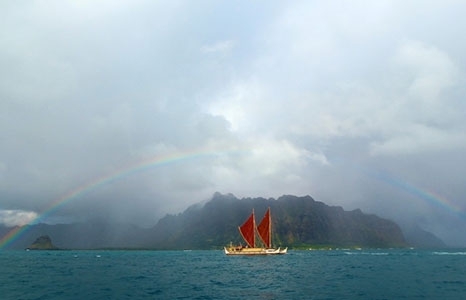 In 1976, a voyaging canoe sparked a cultural revival that quickly spread throughout Polynesia, breathing life into ancient myths and legends. More than four decades later, Hōkūleʻa continues to inspire a new generation of navigators and voyagers to gather their courage and sail beyond the horizon of the Pacific. Moananuiākea: One Ocean. One People. One Canoe. celebrates the historic Worldwide Voyage that connected countless individuals and communities from around the globe. A voyage that also represented the fulfillment of the vision of Nainoa Thompson and his contemporaries, the passing of the mantle to the next generation of kānaka maoli who will retain the skills of their ancestors and perpetuate this tradition for generations to come. It is truly incredible to see the resurgence of a people and their culture, and the decolonization of mind, body and spirit.